» My Patagonia DAS Parka Review: Is This for You? 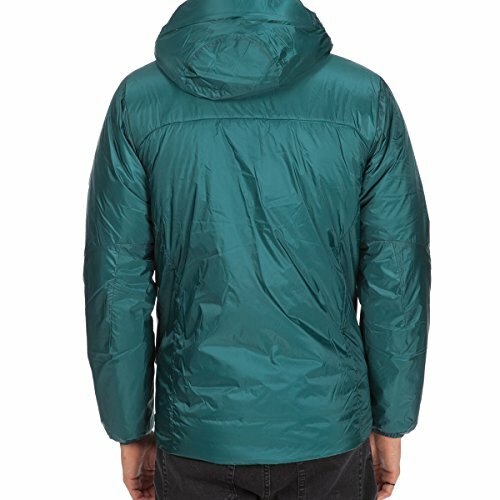 My Patagonia DAS Parka Review: Is This for You? It’s easy not to think about cold and wetness when you’re cruising up the side of a mountain (or whatever your winter wonderland of choice happens to be), your heart is pumping, and your body is radiating heat. But as soon as you stop moving, you start losing heat fast. That’s when it’s time to reach into your pack and pull out your trusty belay parka; not having a warm enough jacket for those stops can be deadly. If you don’t have one (or you do but it needs replacing), look no further than the Patagonia DAS Parka (although there are a few caveats). Wait, is this just for climbing? No! The term “belay parka” does come from climbing – it’s the jacket you throw on while you’re standing around belaying, and then take off when you’re actually climbing because it’d be too hot to wear while you’re moving. And the DAS Parka has certainly been designed with alpine climbing and mountaineering in mind. 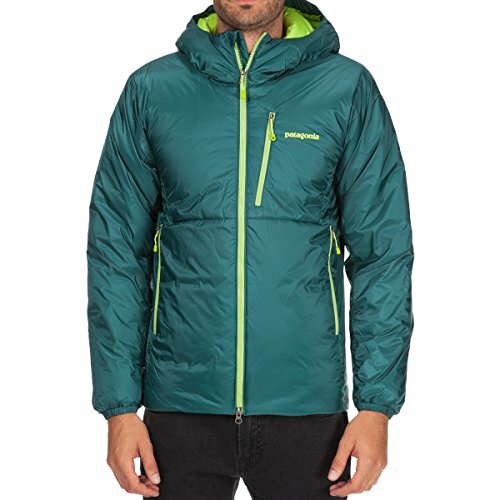 But if you’re not a climber, that doesn’t matter – this is a jacket that’ll keep you warm outdoors in winter no matter what you’re doing, and it doesn’t have any climber-only features. Anybody looking for a warm winter jacket should at least consider the DAS Parka. The biggest decision you have to make when looking for a new belay parka is whether you want a down-filled parka, or a synthetic jacket like the DAS Parka. If you’ve compared down and synthetic before (in looking at sleeping bags, for example), the differences are exactly the same in jackets. Down is lighter and it packs down smaller, but it’s completely useless when wet, and it tends to be more expensive. Synthetic is heavier and bulkier, but it’ll still keep you warm when it’s wet, and it tends to be cheaper. Which you want, then, probably depends on your climate and your budget. Those who are routinely climbing or doing other outdoor winter activities in wetter areas would be well advised to go synthetic. If you live somewhere dry, you might be better off with down, but keep in mind that even if it’s not snowing or raining, melting snow and ice can soak through your gear pretty fast if it gets warm enough. Personally, I prefer synthetic just for the comfort of knowing its insulative properties remain even if I get wet. 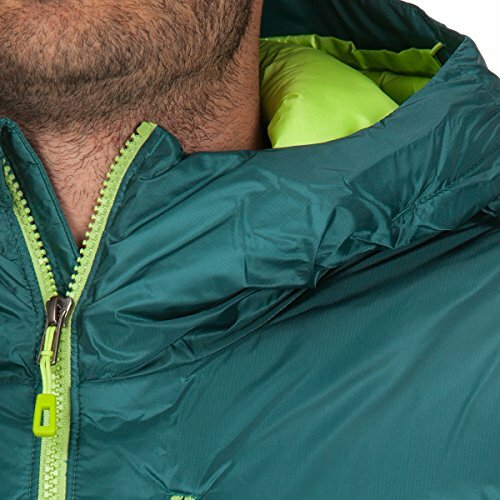 The DAS parka gets its name from its most important feature: Dead Air Space. It’s insulated with ultra-thin Primaloft Gold fibers that form tight air pockets. These pockets – spaces of dead air, if you will – are poor conductors of heat, meaning that the heat your body generates stays with you. It’s surprisingly effective – so much so, in fact, that you wouldn’t want to wear this jacket while you’re moving unless it’s really cold. DWR finish to make it mildly water resistant (the Primaloft will still insulate even if the jacket’s wet, but the DWR means that the jacket’s outer shell can also shed light rain or snow without issue). Elastic cuffs and a drawcord at the bottom to keep you sealed in. Helmet-compatible hood with drawcord to keep your head sealed in. Two large zippered hand warmer pockets and a single zippered chest pocket as well as two inner mesh pockets. It’s warm. Really warm. The DAS Parka is meant to be the synthetic version of a beefy (700-800 fill) down parka, and it truly delivers. Especially as part of a layering system, you would have to encounter truly extreme conditions to find a situation where the DAS Parka wouldn’t work. Last year, for example, I was out on a windy mountain in an ambient temperature of less than -15 F, with windchill likely pushing it down to -40 F or even colder. It was cold enough that I was wearing the parka even when moving, on top of a couple other layers, but that proved plenty to keep my core warm. I’m not sure how long the DAS parka could keep you warm in those conditions because we didn’t stay out in them for long (and neither should you), but as far as I’m concerned it’s warm enough for almost any mountain adventure you might have in the lower 48. Like most Patagonia products, it’s also incredibly well-designed, and quite sturdy. The pockets are large and excellent for warming your hands up (especially if you toss a hand warmer into each), and the hood is as comfortable as it is warm when it’s fully battened down. The overall build quality of the jacket is excellent, and after over a year of use (and plenty of time stuffed into the bottom of a dirty pack) mine still looks almost brand new. All of that warmth comes at a price: weight and collapsibility. 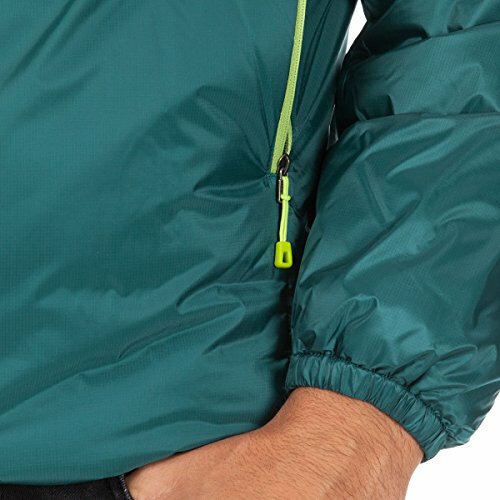 At almost 24 ounces, it’s heavier than many other synthetic jackets on the market (though most of them are designed to be mid layers), and of course heavier than most down jackets. The difference isn’t massive – if you’re looking for a belay jacket than can handle very cold temperatures (something like the Marmot Guide down jacket) then the weights are often going to be relatively comparable. There are lighter options, but if you need a full-on belay parka, the DAS Parka’s weight really isn’t a reason to eliminate it from consideration. Where the DAS Parka really suffers is packability. It comes with a stuff sack because it needs one – this is not one of those jackets that packs down into its own pocket. It’ll take up a significant amount of space in your pack (think small sleeping bag), and that matters, because it’s going to stay in your pack a lot of the time. If you’re climbing and want to keep it on your harness for accessibility, the stuff sack does have a loop through which you can thread a carabiner, but I think climbing with it there would be distracting because of its bulk – like climbing with a medium-sized throw pillow attached to your hip. Whether that’s a dealbreaker for you probably depends on your pack and your packing style. If you like to move light and fast and you’ve got a tiny pack to match that style, the DAS Parka may simply be too bulky to fit. But if you’ve got a pack that often has a little extra space, or if you’re the type who someone always manages to make tons of gear fit into tiny spaces, then the DAS Parka could be perfect for you. Personally, I find the DAS Parka’s bulk annoying, and I’ll admit that it occasionally makes packing more of a chore than it might be if I had some ultralight down layer instead. But it’s not enough of a problem that I’d ever consider leaving the DAS Parka at home. Even when it spends an entire trip at the bottom of my pack, I don’t regret taking it, because on those occasions when I do need to whip it out, I know it’s going to keep me warm and dry. And in the winter, staying warm and dry is probably the single most important thing you need your clothing to do.